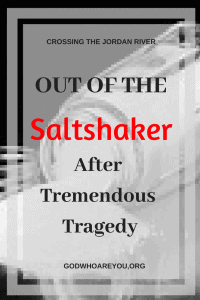 M9F How Can We Move Out of the Saltshaker? | GOD Who Are You? AND Who Am I? M9F How Can We Move Out of the Saltshaker? “I wanted others to see Jesus in me and to have an intimate relationship with Jesus Christ, but it wasn’t happening. It didn’t happen until I spent time on my face before God where He revealed I had self in the way. I found that as I daily asked for the Lord to take over, and for self to die, things changed.” Patty LaRoche is a spiritually salty, four-sided, balanced Christian who makes others thirsty. Why? Because she moved out of the saltshaker. Patty’s mother brought her children up in the church. However, Patty came away feeling like God was someone to fear—a judgmental God with a great big club in His hand ready to jump her if she got out of line. She thought if she died with a mortal sin on her soul, she would go to hell. She incorrectly believed getting to heaven was all about being good enough and working her way there. Patty met Dave when she was a flight attendant. She married him without the blessing of her church, thinking she could eventually get him to join her one and only true church (as she had learned)—the only way to get to heaven. It did not work. As a professional baseball pitcher, Dave was on the road. Patty followed the seasons with him. Very tragically, they lost two babies under very bizarre circumstances. One doctor actually broke her water causing the baby to be born premature, so he could be known as the doctor who birthed the child of Dave LaRoche. Depressed and with her wine and cigarettes, Patty spent most days in her pajamas—mad at God and feeling He was mad at her. A girlfriend called, “Patty there’s an evangelist in town. No, I have to do good works. But the Holy Spirit got hold of her and the tough wall around her heart melted at hearing the Word. As her friend drove home, Patty stuck her head out the window and yelled to each person on the street, “Jesus loves you! Jesus loves you, too!” She could not help herself. She was a new creation in Christ Jesus. That night after getting home, Dave called, “How are you doing, Patty?” “Oh, I had a great night!” Silence. In thirty years, Patty moved with Dave thirty times. In each place they found a church they both attended. She shared Jesus with everyone God brought across her path. She felt she was not Bible smart, but she had her own testimony to share and she did—just as the Samaritan woman shared—the one who met and believed in Jesus at the well (see John 4). Dave began coaching the Chicago White Sox when their three sons, who also played professional baseball, were in their teens. The player’s wives did things together, but it seemed the coaches’ wives were not included. Patty did not know what to do about it. In her devotions she read Matthew 5:13, “we are the salt of the earth.” The word are said to her that she needed to do something—but what? She prayed and prayed about it. Get the women organized, was her answer. She organized a softball team and a women’s Bible study. Patty learned this lady had previously been isolated which caused her to build walls against others. It was an amazing summer. In Patty’s vibrant joyful spirit she says, “Christians are Christians, like dogs are dogs and chase cats. We should not have to ask ourselves if we are a dog and if we chase cats. Getting ourselves out of that saltshaker means taking risks. And Jesus tells us if we are ashamed of Him and His words, He will be ashamed of us” (see Mark 8:38). Patty can say of God Most High, “He brought me out into a spacious place . . . You broaden the path beneath me” (Ps. 18:19, 36).